GUY FOUND A MYSTERIOUS AMULET IN HIS PILLOW WITH HIS PHOTO. You are at:Home»Caught In The Act»GUY FOUND A MYSTERIOUS AMULET IN HIS PILLOW WITH HIS PHOTO. Long story short, woke up this morning to find an object in my pillow. It was a white small package, wrapped with multi coloured thread and sealed with a wax stamp that had a star on it. Opening the whole thing up was tough. it felt like layers of adhesive paper one on top of the other. when i finally managed to open it up, i was horrified to find a green piece of paper with what seems to be arabic text written on it. but the horrors don’t end there. included in the package was a very recent photograph of me, and what frightens me the most is only three people including me have that photograph. The other two are close family members that have told me they have no idea what’s going on. Circumstances dictate that there is no logical answer to this puzzling mystery. There have been answers ranging from a good luck/safety charm to someone girl trying to curse me. What do i do? Do i dispose of it all? Do i keep it? thanks in advance for your help guys. 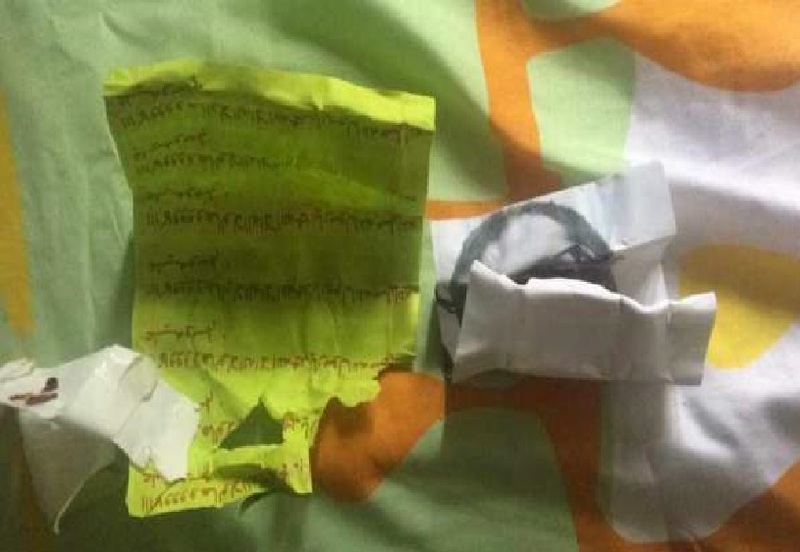 Edit : Thanks to someone at r/translator , it would seem that the note was some kind of a safety charm to ward off evil spirits written in arabic. So i’m relieved for myself at the moment. In the meantime, i’m hoping to get some answers from a person at a mosque to find out who might’ve done this and why. As much as i’d like to think some loved one would’ve done this for me, my family is very pious when it comes to religion, so im doing my head in wonderng if they would actually have to turn to Islam for this? But thank you all for your helpful(and hilarious) replied. Previous ArticleZOO IN CHINA THROWN LIVE DONKEY TO BE FED TO THE TIGERS?!?! ?